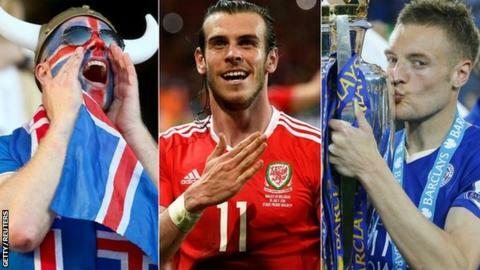 Will Querrey's name be added to the list of sporting shocks that already includes Iceland, Wales and Leicester City? If this unhinged year of underdogs, upsets and toppled totems continues, then the shocks will eventually become so routine that they no longer surprise us. The sporting Richter scale requires recalibration after the last few months. A 5000-1 shot won the Premier League. A nation that had failed to win a rugby World Cup match in 24 years beat the two-time world champions. A football team led by a part-time dentist defeated a country with a population 200 times larger. And then came Saturday at Wimbledon. The most dominant male tennis player in almost half-a-century - winner here for the last two years - was sent hurtling out of the tournament by an opponent who suffered first-round defeats in his previous two Grand Slams. "Sometimes," said Sam Querrey's coach Craig Boynton after the 6-7 1-6 6-3 6-7 defeat of world number one Novak Djokovic, "even a blind squirrel finds a nut." If that sounds a cruel verdict when your charge has just pulled off the greatest single performance of his career, you could forgive the bewilderment. Not since 1968 had a man held four Grand Slam titles simultaneously, as Djokovic did coming in to this week. Not since the Open era began has a man rattled off 30 straight wins at Slam tournaments. Querrey has always had a whipcrack serve and a game that could fire on grass. He has also just lost in the first round at Queen's, had won only one set against Djokovic in their last four matches and only once before made the fourth round at Wimbledon. Djokovic? It has been seven years since he failed to get to the fourth round of any Grand Slam anywhere, a time when he was a lesser player in a more competitive era. He has won six times as many matches at Wimbledon as Querrey. He is physically and mentally the most indomitable tennis player of his generation. Or he was, until the strange fever that has swirled around sport these past months came to settle on Court One this weekend. So unrecognisable was Djokovic in his two-day defeat that you almost expected Querrey to reach across the net at the denouement and pull a mask off his opponent's face, revealing a cowering imposter where the great champion should have been. Querrey had swung at everything on Friday evening and connected with most. But even a two-set overnight lead means little against a player with Djokovic's resolve and resources. When the 12-time Grand Slam champion won the first four games of the third set, there were few courtside who could see beyond the familiar tale. And then came the fourth set, an hour of sport so magnificently flawed, so wonderfully error-strewn, it was impossible to take your eyes off it. Querrey seemed shot. Across his first four service games the aces dried up and the groundstrokes lost all accuracy. A total of 25 unforced errors flowed from that formerly sweet racquet. Break point followed break point. So defective was the Djokovic machine that 11 break points came and went without being taken. When he finally capitalised on the 12th to move within a service game of levelling the contest at two sets apiece, he was promptly broken back. Nothing made sense. Three times the match was interrupted by rain, twice when it appeared to be falling from an entirely blue sky. Even in the tie-break, each man seemed desperate to hand it away - Querrey missing the simplest of overheads, Djokovic giving the mini-break back with a backhand wide under the most minimal pressure. Djokovic, so imperturbable in his ascent to the top, was a mess of screams and shouts and desperate looks to his box. There, looking increasingly like a bleary-eyed golden bear, his coach Boris Becker shook his ursine head and watched impotently as two more backhands died in the net. With them went the crown. Becker himself has been victim of a Wimbledon regicide, beaten by rank outsider Peter Doohan in the second round in 1987 after winning the previous two men's singles titles here in a blizzard of thunderous serves and dive volleys. Even then he did not enjoy the same dominance across all surfaces as Djokovic has since his defeat by Stan Wawrinka in the French Open final 13 months ago. Roger Federer lost to the unheralded Sergiy Stakhovsky here in 2013 when he too was reigning champion. Lleyton Hewitt was dismantled by the threshing-machine serve of Ivo Karlovic in the first round of 2003. Rafa Nadal's last four Wimbledons look like this: 2012, loses to world number 100; 2013, loses to number 135; 2014, loses to number 144; 2015, loses to number 102. None were in Djokovic's form, none were on his unbeaten run. Perhaps only Roger Taylor's defeat of Rod Laver in 1970, with the Australian great on a run of 31 consecutive wins, comes close. Djokovic, as magnanimous in defeat on Saturday as he has been gracious in victory so often, refused to blame injury, inclement weather or any other outside influence - save his opponent's unexpected excellence - for the end of his extraordinary run. But, just as he was left stunned, so a huge champion-sized hole has been blown in the men's draw. The frenzied reaction around Centre Court when the result flashed up on the scoreboard during Andy Murray's victory over John Millman merely confirmed what the bookmakers had already made clear: the Briton, his nemesis taken out by another sharp-shooter, is now the outstanding favourite. Elsewhere Roger Federer, four years after his last Grand Slam title, will also be raising an eyebrow at the demise of the man who has beaten him in the final here for the past two years. And Querrey? When Leicester's team of has-beens and not-yets could win the title, when Iceland and Wales could yet meet in the final of Euro 2016, could this gangly assassin yet have other bigger names in his sights? He will have his supporters. Last year Querrey took part in the US TV dating show Millionaire Matchmaker. "The date was fun, the girl I chose was really cool," he recalled recently. "At the end of the episode it said we're still together, but actually she never talked to me once after the show was shot." Blind squirrel to some, endearing underdog to others. He has a chance. But in this upside-down era, who doesn't?